The ongoing increase in daily users of the London Overground network and a workforce of only 1,500 staff meant that Lorol station staff were under a lot of pressure. When trying to resolve customer queries, staff would need to resort to paper documents, which wasn’t practical at busy stations. This made it difficult for members of staff to be able to provide important customer service information to passengers. Access of information an issue for LOROL. Many of the London Overground workforce were mobile between stations, meaning that an intranet system would not be a practical solution. LOROL needed a system that provided information to staff wherever they were on the network. 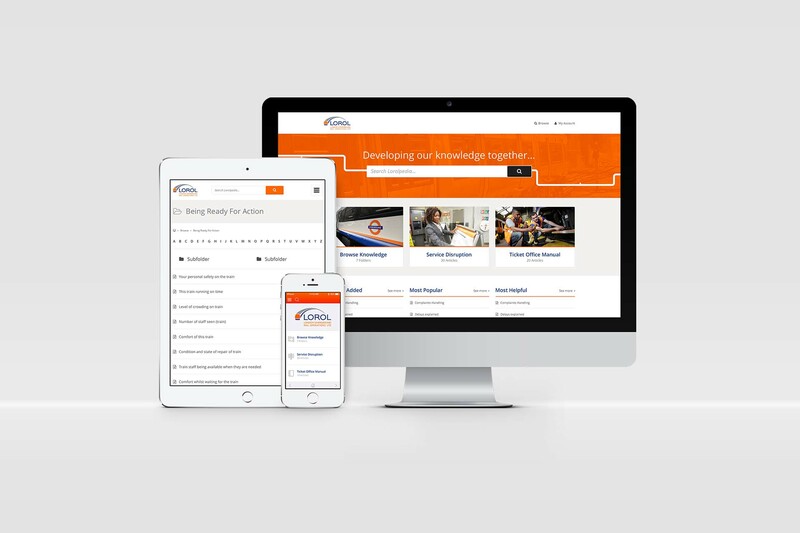 We worked with Lorol to develop the Lorolpedia, London Overground’s very own digital knowledge-base app. Lorolpedia is London Overground’s very own Wikipedia-style service encyclopedia that frontline staff can access on their mobile devices. The app includes a reference library which gives staff access to information on processes, manuals, procedures, internal communications and best practice for customer service. We worked with LOROL to build Lorolpedia in two parts; designing the web app and then developing the technical functions in the back-end system. When designing Lorelpedia, had to make sure that its design reflected its main purpose: to allow employees to access accurate up-to-the-minute information to improve customer service. When trying to assist customers at a busy station, frontline staff needed to have quick access to the correct information through the screen on their mobile devices. Therefore the user-interface needed to be designed to allow a clear display of information on any device. To solve this we designed the app to be responsive on all devices and the user-interface streamlined and functional, with a clear and comprehensive layout. We designed the backend system to allow staff to add articles and information themselves and in most formats. We also designed a user-friendly web-based editor, which allows staff to quickly create and upload articles. Improved speed access of information for London Overground employees. As of May 2016, Lorolpedia contained over 280 staff information articles. Lorolpedia was submitted as part of LOROL’s portfolio for the Modern Railways Industry and Technology Innovations awards and won the “Passenger Experience” award. Arriva Rail London has now taken over as the franchise and Lorolpedia continues to be used by Arriva Rail London’s frontline staff. We assisted LOROL with ongoing technical support and were on-hand in helping the continuous growth of Lorolpedia in addition to providing web hosting services.